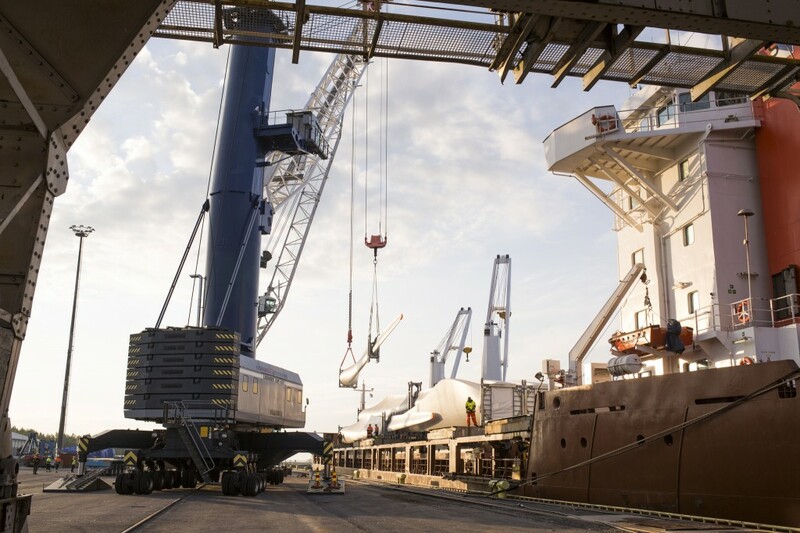 The joint port company for Umeå and Vaasa, Kvarken Ports Ltd, presented good results, both financially and volume-wise, for it´s first operational year. ”The aim for the first operative year was to integrate two separate ports and two different working cultures into a single entity. We achieved this target. Additionallly, we invested a great deal in visibility and in promoting our unique port concept”, says MD Matti Esko. Kvarken Ports handled 3,4 million tons of goods in 2015. The volumes for Umeå increased in traditional goods as export of paper products and import of oil. The container volumes increased substantially, 15 percent, reaching the new record of 25 000 TEU. In order to support the growth in container traffic, the port company has ordered a new mobile crane with an lifting capacity of 125 tonnes. The crane will be delivered to Umeå in May 2016. Kvarken Ports has also started the planning of a new the container yard and quay area. The volumes for Vaasa dropped due to the reduced import of coal. The reduction is due to a structural change, which means that an increase in other goods is important for Vaasa. ”There is a great potential in project cargo and transports from the regional export industry and the local energy cluster”, says Markus Rönnblom, Marketing and Sales Manager at Kvarken Ports. The ferry connection, which is operated by Wasaline, presents a continuing positive development in both cargo and passenger volumes. During last year 168 557 passengers travelled between Umeå and Vaasa and the total cargo volume reached 276 641 tonnes. Kvarken Ports will, during 2016, continue participating in the strategical development of the ferry traffic within the project Midway Alignment of the Bothnian Corridor. The total turnover for Kvarken Ports amounted to 75,8 million SEK. The profit exceeded the budget due to extensive synergy benefits and other savings. ”The first operational year of Kvarken Ports has proved the concrete benefits of the merger in both economic terms and volume-wise”, states MD Matti Esko.